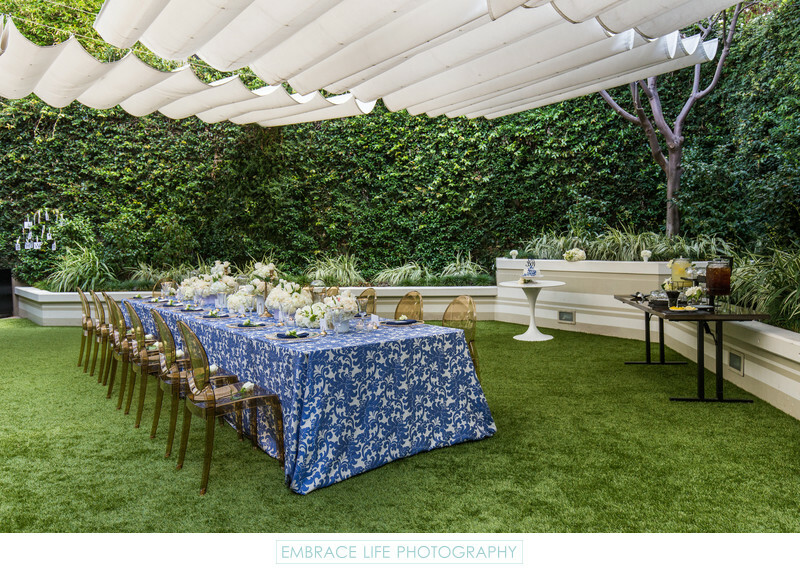 This overview photograph shows the beautiful garden setting of this surprise baby shower for Inna Savluk of Butterfly Floral and Event design. Her wedding planner friends, Deanna Tat of Chic Ambiance Events, and Nam Lam of Modern Los Angeles weddings held the shower at Le Meridien Delfina in Santa Monica, CA. Cindy Celis of Luxe Linens provided the gorgeous, blue and white toile table linen, Line 204 provided the unique acrylic chairs, place settings were from Classic Party Rentals, and Lovesome created the cake decorated with blue butterflies seen in the background on a modern white cake table.